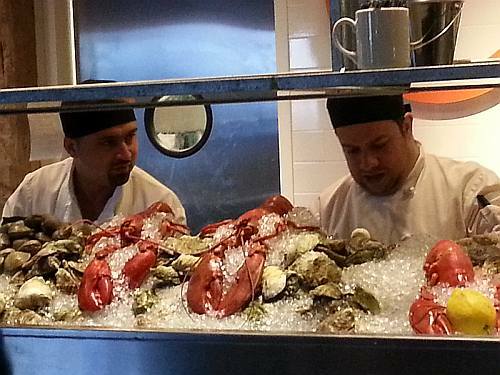 Come for oysters, stay for the chilled lobster and smoked everything: salmon, rillette, scallop, shrimp and uni toast. Roseanna's half lobster appetizer pops out of its sea-poached shell. Ethel, who makes them for Island Creek Oyster Bar too, knows her way around lobster rolls she plates with slaw and chips. She puts them up two ways: warm, on buttered rolls, and chilled. 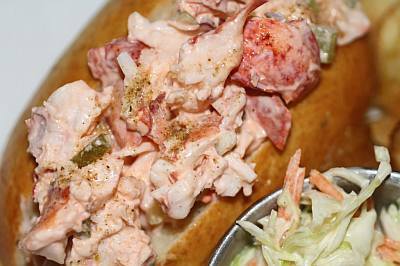 Lobster rolls are an endless neurotic contest right now on the East Coast. I'm sure she will understand if you can't make up your mind. We're back, Janet and I, at the bar. It's Friday and one Hungarian Evolúció Furmint later, Janet reports tart and sassy. She orders Wellfleets and I my Island Creeks. We taste test: Wellfleets are briny with a bite of bitter, a keeper for her. Mine are noticeably saltier. And so you know, there is no "I can take it or leave it" when it comes to oysters: You're either an oyster fiend or you're not. You could say it makes living here worthwhile but that's not true. When you have three feet of snow on your car, it's going to take more than oysters. What is true, however, is that these particular plates make "oysters for a buck" deals less pressing. I'm reminded of Island Creek Oyster Bar, they're related, where I had my first Island Creeks. Their sea bite calls out for "more beer, please." Which is not to say Row 34's other ten varieties from the Cape, Rhode Island and Prince Edward Island aren't wonderful too. It's just that now I can tell the difference. The bartender tells us they trucked 25,000 oysters in three months this winter: Island Creeks, Wellfleets and the Row 34s and that's before any of us had written a word about it. (I didn't think to ask how many Barnstable and Vineyard clams.) Anyway, if an icy plate of Island Creeks smacks down, and if these are the oyster years, let us be grateful I didn't give up learning how good they are from my Dad. We're not done. Our next plate is oysters fried in light batter with peppery burn and even we, modest eaters that we are, are thinking it's a good time to order more. We don't. Dreamy tartar sauce whipped from scratch is for dunking shoestring fries. These American classic oysters need nothing as in nothing but lemon, and maybe not even that. The debate: go fried or keep it raw? It's five o'clock somewhere. Julie and I like our weekday lunches in the city. Unlike dinner, you can get in anywhere when you turn up at noon. Row 34's patio is open and we are in the middle of jackhammers and steel workers. We count all the trucks turning onto West Service Road. It's okay, just keep the oysters coming. Julie's wine: Domaine Richou Anjou Blanc Chauvigné that she's loving with Daisy Bays from PEI, Island Creeks and Ichabod Flats out of Plymouth, near but not of the Cape. Mine are Island Creeks, of course. Even the server is looking proud of himself as he sets them down. 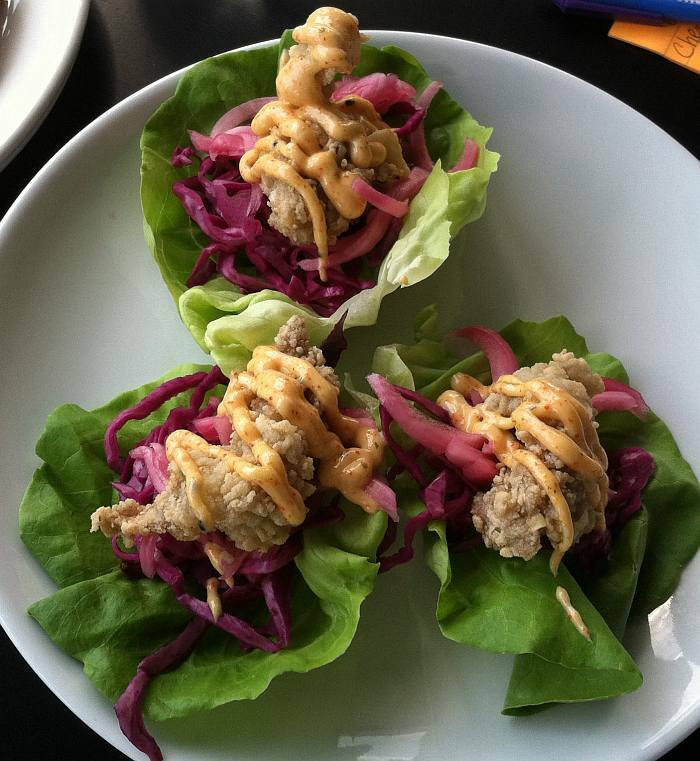 Next, Boston lettuce cups with crisp oysters and pickled vegetables. For openers, try not to lose any fiery aioli. I have a weakness for oyster sliders and these show up with none of the roll guilt. 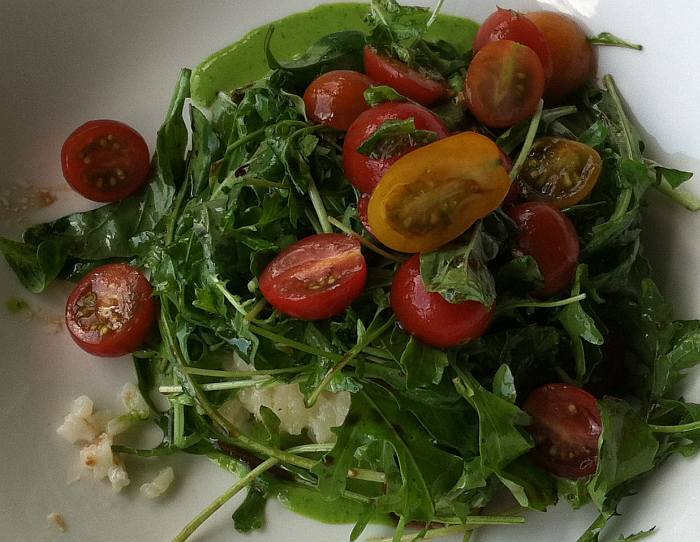 Julie's risotto cake, hiding under summer arugula and tomatoes, is sauced with what looks like pesto but it doesn't taste anything like basil. Is it arugula infused oil? Risotto is crisp enough to crunch and she's keeping it all to herself. Today's dessert is peachy pie. It's not the whole pie, home cooks. Crimped edges keep a lock on fruit that's been jammed, lemoned and limed in a flaky crust that works for two, if you're good friends who won't order your own dessert and you share and you're wondering if there's time for more. 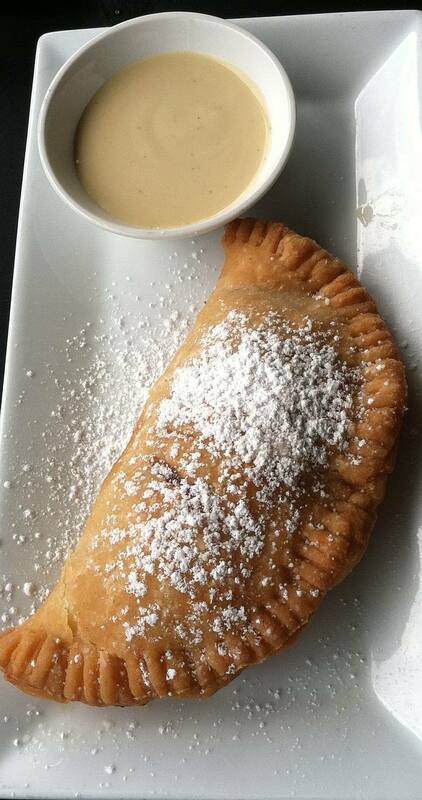 No one passes up anglaise either. I'm standing by the white board. Am I an oyster now? It's my reservation, cool. Behind the maître d, see the private room, as in so private they close the door in between oysters and wine. We consider how fun it would be to invite 50 friends here. Wait, do we even have 50 friends? Still, Row 34's patio is this cat's meow. It befits a neighborhood half cool but mostly retro with rows of warehouses yet unchanged. We salute Fort Point as it molds these bricks into just rustic enough high-ceilinged venues with rents to match and then some. Plus, it's a nice walk over from South Station. Plus, Trillium Brewery is next door in the alley. Company dinner, check. Oysters at the bar, you bet. 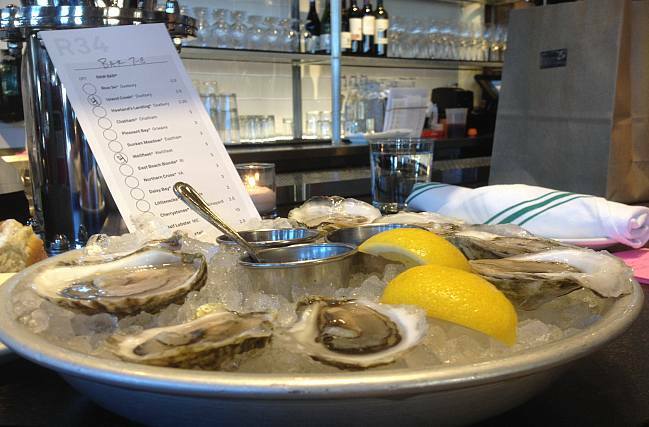 The credit card slip says "eat oysters." Check, check, check.